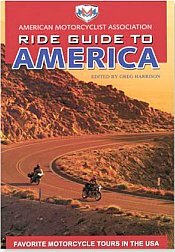 Motorcycle Tours and Travel Focus of "Ride Guide to America"
Motorcycle tours and travel on less traveled roads are the focus of "Ride Guide to America" offered by the American Motorcyclist Association. Enjoy 36 scenic tours throughout the United States. This high-quality collection of motorcycle tours and travel offers a nice mix of color pictures and maps, plus a good balance of useful road descriptions with turn-by-turn instructions. The 40 detailed, topographical road maps help you follow recommended routes and show what kind of terrain you'll encounter along the way. The trips accommodate various riding styles from sport riders looking for curves and hills to sightseeing travelers who like to slow down and actually stop occasionally. There's plenty of information about scenic vistas, oddities and must-see places that are the essence of motorcycle tours and travel. "…This is America's original oil country. "But it was also here that in the late 1850s, a former train conductor and jack-of-all-trades by the name of Col Edwin L. Drake changed the world. "You could think of Col Drake as the great-great grandfather of all motorized transportation. No, he didn't invent the motorcycle or the automobile. He developed the fuel that made all that possible. Right here, about a mile up the road. "I click the Triumph into first and aim for the northern end of Oil Creek State Park near Titusville, Pennsylvania."